Very many thanks EX33 and EX34 Magazines for mentioning my new book Law and Peace in the following article (below is the EX33 version) which you can also read here. You can buy the book on amazon. Braunton resident Tim Kevan will have his second novel published by Harry Potter’s publisher Bloomsbury in May. 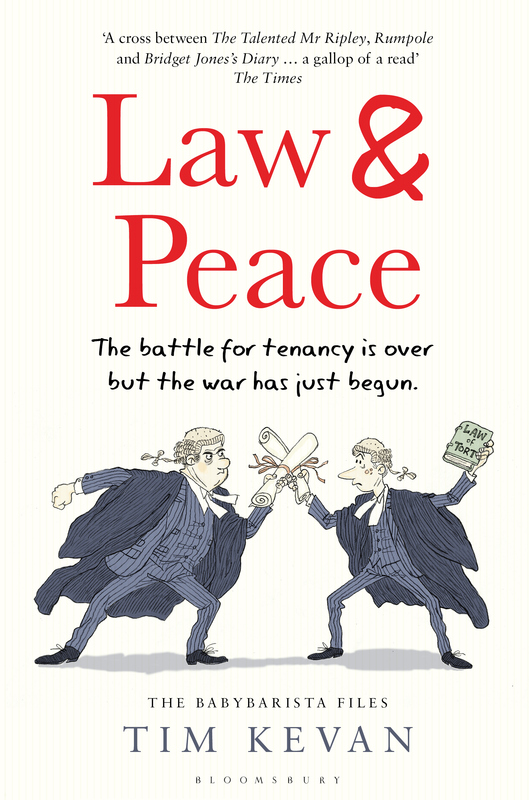 It’s called Law and Peace and is a sequel to his first book, Law and Disorder, which was described by broadcaster Jeremy Vine as ‘a wonderful, racing read – well-drawn, smartly plotted and laugh out loud’ and by The Times as ‘a cross between The Talented Mr Ripley, Rumpole and Bridget Jones’s Diary’. That book was a comedy about life as a barrister and centred around BabyBarista’s first year in chambers. It included characters that probably exist in most workplaces such as UpTights, OldRuin, BusyBody and Worrier. Alongside the pupillage race was an altogether different battle with BabyB’s corrupt pupilmaster TheBoss whose dishonest fiddling of chambers’ records to avoid a negligence action all started to unravel and threatened to embroil BabyB’s entire career. The second book carries on where the first left off and BabyBarista must face down old enemies, try to win compensation for a group of ASBO-attracting pensioners and unravel the complicated knots of his love life – not to mention his mother’s finances. Under the wise and watchful eye of OldRuin, he tries to keep his nose (and his wig) clean, but when SlipperySlope, an unscrupulous solicitor, offers him a quick way out of his financial difficulties he soon becomes embroiled in blackmail, dodgy share-dealing and the dark arts of litigation. With his old adversary TopFirst out for revenge and the chance to be awarded a coveted ‘red bag’ at stake, BabyB has to use all the tricks of his trade to extricate himself from his legal quagmire, win the case for his mad old clients, and somehow convince his best friend Claire to fall in love with him. There’s Machiavellian plotting galore but tempered with a real sense of pathos for the characters and their plight. What’s more, the fictional BabyBarista even takes a trip to North Devon and finds that surfing helps him to discover what’s really important in life. Brought up in Minehead, Tim moved to Braunton a few years ago after a career as a barrister in London. These days, aside from writing his novels and a blog for The Guardian, he can otherwise be found surfing or jogging on the beach with his border terrier Jack as well as occasionally supping the odd pint of Doom Bar in the Black Horse pub in Braunton.